Sometimes, when I read the Bible, I like to imagine myself within the story. I ask myself, who am I, what can I see, touch, hear and smell. I find this really helpful when it is a well-known story and a text that I am tempted to almost “skip over” and so would miss what God may be wanting to say to me. This morning I was in for a bit of a surprise! I was faced with a story I had read countless times from Luke’s Gospel chapter 10. Jesus is invited to stay in the home of Martha and Mary. 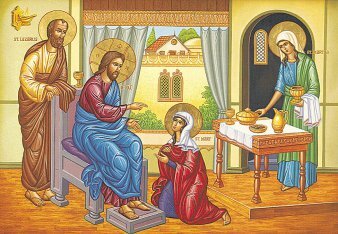 Martha does all the work and Mary sits at Jesus feet. If you want to read it for yourself, you will find it in Luke 10 vs. 38 – 42. Now, as I said, I have read it countless times before. I have even imagined myself in it before. The last time I looked at this passage I was one of Jesus’ followers who was tired from the trek and looking forward to a good meal (I do enjoy my food). As I pictured the scene in my mind I could see Mary sat at Jesus’ feet and I felt a sudden surge of what I can only describe as resentment. I realised that (please excuse the clumsy phrasing) I was a Martha when I really wanted to be a Mary! At that moment, I was wanting to give my focus and full attention to God but, in reality, my mind was elsewhere. I wanted to sit in God’s presence and know of His peace and love surrounding me when, in reality, my mind was distracted by the difficult meeting, the mountain of paperwork, the phone calls I needed to make, getting ready for another meeting, preparing talks, handling e-mails and why is there nobody that can help me? I was a Martha when I wanted to be a Mary and I am sure I am not the only one who has experienced this. I cannot ignore my distractions because, they are the very really tasks and challenges of my working day but, I can choose where I allow myself to focus. Let me try and explain what I mean. Martha was doing nothing wrong, she was only wanting to be a good host however, her timing was out! She should have taken the opportunity to join Mary at Jesus feet. Then, when the time was right, Martha and Mary together would have been able to do what needed to be done. I shared with Jesus those things that were distracting me. He wasn’t surprised. He knew about them anyway. For a few moments, I was able to park them and become a Mary. I enjoyed just sitting in His presence knowing He was there with me at that moment and I got to listen to Him. Thank you for the message. Was the picture at the beginning of the article taken by your usual photographer at your house? A timely message though! Keep your chuckle muscles going!